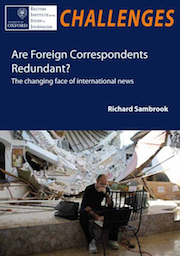 Oxford study: What’s the future of foreign reporting? Our friends across the pond, at Oxford’s Reuters Institute for the Study of Journalism, ask that provocative question in a report they released this morning: a rigorous study of a globalized (er, globalised) ecosystem of news. The days of information centralization may be over. “The model of a foreign correspondent, working from a fixed overseas bureau, is well established across all forms of international newsgathering – newspapers, wire agencies, broadcasters. It is a feature which grew from the industrialisation of news production in the late nineteenth century, when a limited number of organisations had sufficient resources to gather and distribute news, with owners seeking the prestige and influence that reporting international events brings. The downward spiral in the amount of foreign news coverage we’re familiar with in the U.S. is primarily a Western phenomenon. Social media help reporting…but can also hurt it. Globalization helps reporting…but can also hurt it. Garber, Megan. "Oxford study: What’s the future of foreign reporting?." Nieman Journalism Lab. Nieman Foundation for Journalism at Harvard, 8 Dec. 2010. Web. 20 Apr. 2019. Garber, Megan. "Oxford study: What’s the future of foreign reporting?." Nieman Journalism Lab. Last modified December 8, 2010. Accessed April 20, 2019. https://www.niemanlab.org/2010/12/oxford-study-whats-the-future-of-foreign-reporting/. | title = Oxford study: What’s the future of foreign reporting?